Author: Albrecht, C. M. Set In . . . Description: This incredible publication includes all your favorite games and puzzles, from Alphagrams, Matching Puzzles, and Crosswords to Name That Tune, Musical Sudoku, Word Searches, Mazes, and more! 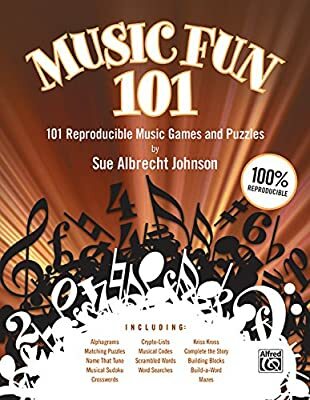 Clever, educational, reproducible, and fantastic fun for everyone, Music Fun 101 is a must for your music classroom. 100% Reproducible. Recommended for grades three and up. Use as a supplement to a topic or unit, an extra credit exercise, or a homework assignment. Perfect activity for substitute teachers or an easy last-minute classroom time-filler. Includes answer keys. The comb binding creates a lay-flat book that is perfect for study and performance.